Track is the basis of every railroad, model or real. The technology has been evolved over many centuries, and is now capable of supporting trains that run over 500kph. Track includes the steel rail on which run the wheels, but also the foundation or roadbed, which includes the ties or sleepers (the cross pieces made out of wood, steel, or concrete) and the bed of stones that keep it up off the ground, so that it drains readily in wet weather. This is called ballast. The technology always improves, but the design is basic mathematics and trigonometry. When a train passes from one track to another it uses points or switches, when it crosses other tracks it uses diamonds or crossovers. Track design simply ensures the passage of a train from one point to another. Keep it simple. I minimize what are called S bends, they can cause derailments for long carriages. In the photos below, you can see at diamond number 1, I cross from a westbound track, over the eastbound track to a relief track, and this eliminates the S bend by using the straight diamond. In this photo, I have installed 2 of the 24640 diamond crossings to run any train to or from the relief track, across the eastbound (diamond 1) from the westbound, to the relief, and across the westbound (diamond 3) to the eastbound, from the relief. Diamond number 2 is used to get west bound trains into a station loop line, by crossing the eastbound. 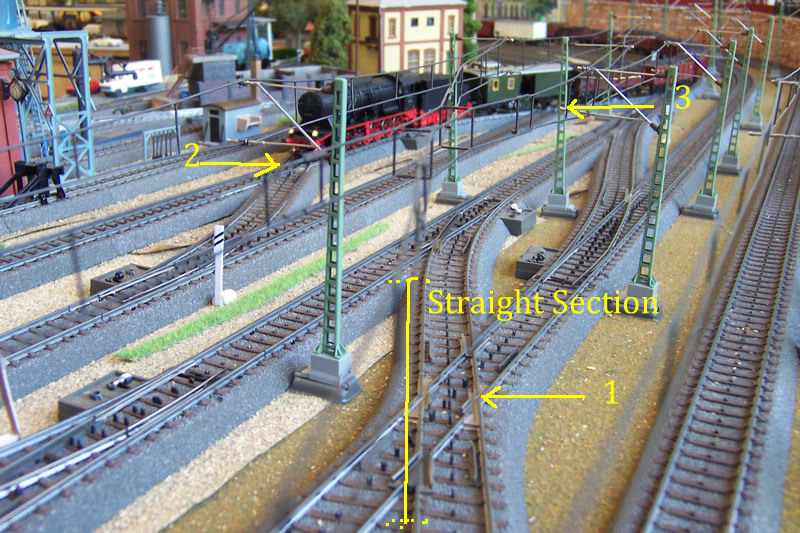 There is no special wiring, as the layout is digital, just the B (bahnstrom) and the O (ground) wire to the track. Marklins track also incorporates the roadbed (ties and ballast) and clips together. Here is the same track area taken from above. Again, the diamonds are numbered 1, 2, and 3, and I have highlighted the fact that they incorporate a straight. 24711 are points that allow trains to pass from one track to another at a reasonable speed. 24611 are points with a sharper curve, and generally must be negotiated at a slower speed. This picture illustrates the use of an S bend- sometimes that is the only way to achieve a result. In the case of short wagons, it does not present a problem. Sometimes longer carriages might derail, but generally Marklin rolling stock is very compatible with all their track systems. I have put in the Marklin product numbers.